Indianapolis Motor Speedway history has been stuck on four – four event winners – for a lot of years. Two Sprint Cup teammates think too many years, and would love like crazy to do some un-sticking on Sunday afternoon in the 2013 running of the Brickyard 400. Hendrick Motorsport’s Jimmie Johnson and Jeff Gordon have each won four Brickyards since NASCAR began racing at the famed 2.4-mile rectangle with rounded corners in 1994. And talk about symmetry: Johnson was the last driver to win at Indy and Gordon was the first. In winning four, the two Hendrick drivers have earned the right to look horizontally into the eyes with such racing legends as Rick Mears, A.J. Foyt, and Al Unser Sr. The opportunity to become the first American to win five is overpowering to Johnson and Gordon. “Fifth would be incredible,” Johnson said Saturday morning. 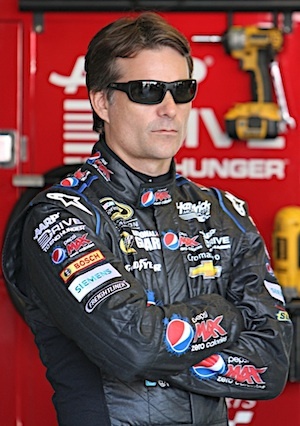 “To do anything Jeff Gordon has done is huge. The guy is massive in our sport and had done so much. Truthfully somebody I looked up to as a young kid racing and still do today. He started off as a hero of mine and turned into a friend and a teammate. It’s been an amazing ride all along, but to tie what Jeff has done here at the speedway is just absolutely amazing. Gordon, who grew up in Indiana after moving there from California as a kid, said that while winning five Brickyard 400s would be terrific, it would not be totally terrific. Totally terrific belongs to the guys whom upon so much of the place’s history was made. Guys who took much greater risks and who did it at a time when there was only one indisputably biggest race in the world. That’s right, because of his background, Gordon lines up with those who say the 100-year-old 500-miler sits atop his list of biggest races. Chances for being the first to five appear to be best for Johnson. He’s the defending champ and has won three of the last five 400s. Gordon’s last came in 2004. Johnson, at 37 years old, is theoretically closer to the prime of his career than the 42-year-old Gordon. And, Johnson, who won five-straight Cup championships from 2006 through 2010, is leading in points and is tied for most victories (four, with Matt Kenseth), is having another championship-worthy season. Johnson has been unofficially installed as the guy to beat Sunday. He understands that. But Sunday’s race will be run with Gen 6 cars for the first time at Indy, a quirky track for all cars which race on it. Johnson sounded a bit wary of the effect. Then there is the unique nature of racing as a sport – it’s the one sport where outcomes are ultimately dependent on machines. Machines that are asked to do some very improbable things. 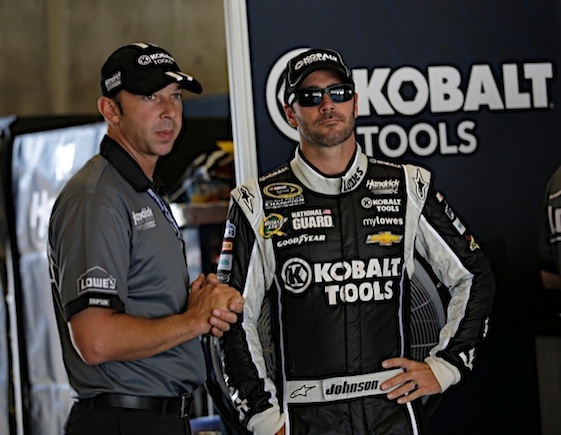 Chad Knaus, Johnson’s crew chief, talked about that aspect of Sunday’s race. “We have got standard push rod V8s that are turning almost 10,000 RPM for a full race,” Knaus, who has wrenched for Johnson since Johnson’s rookie year of 2002, said. “You’re pushing it to its outer limits. In all reality, these engines with the restrictions that we have on how we go forward, they shouldn’t be doing what they are doing. I think it’s phenomenal. So, while 43 drivers will have a chance to win at Indy Sunday, only two will emerge with the right to say he did something A.J., Mearsy and Big Al couldn’t.